Finance Minister Pranab Mukherjee said Friday the government need not hold more than 51 per cent stake in public sector undertakings. The chairman of Kingfisher Airlines, Vijay Mallya, said in an interview with a newspaper on Friday he was close to sealing a $370 million deal with an Indian private investor and a consortium of banks that would save the airline. Foreign exchange losses due to rupee depreciation have hit the profit figures of several companies in the second quarter results for financial year 2011 announced recently. A research report by Kotak Institutional says there have been large forex losses in several cases. Financial services major Standard & Poor's plans to update its credit ratings for the world's 30 biggest banks within three weeks and may well mete out a few downgrades in the process, possible surprising the battered global bond markets. Tatas-owned Jaguar Land Rover (JLR) is evaluating options to assemble more models in India, including the Jaguar cars, as it aims at garnering about 20% share of the luxury segment. Even as the Punjab government is all set to grant approval for setting up of nine new rice mills, under its mega agro projects policy on Saturday, small and medium rice millers have criticized the state government for granting fiscal concessions to these mega units, and thus making business economically unviable for them. Energy major Reliance Industries and London-based BP Plc on Friday announced the formation of an equal joint venture in India that will focus on global sourcing and marketing of natural gas in Asia's third-largest economy. Credit Suisse has included Infosys, Tata Consultancy Services and HDFC Bank in its list of 10 most overvalued stocks in Asia using price-to-book versus return on equity valuation model. Costlier food and clothing pushed up the consumer price index (CPI) by 0.97 per cent in October, 2011, with the broad gauge for measuring retail inflation rising to 114.2 points during the month. The CPI based on retail prices stood at 113.1 points in September, according to data released by the government on Friday. Suzuki Motor Corp and estranged partner Volkswagen seemed headed for arbitration, after VW once again refused to sell its 20% stake back to the Japanese carmaker and end a floundering two-year alliance. While German group VW has long wanted to revive a deal that was once a major strategic coup for Europe's largest carmaker, its hopes have dimmed rapidly with Suzuki repeatedly saying the two must go their separate ways. Speaking at a seminar today on disinvestment, Mukherjee said keeping more than 51 per cent equity in government companies locked up did not make economic sense when resources were required for redeployment in areas where development was needed. This broadly implies that companies where government holding is more than 51 per cent will be pared down gradually to realize value. The minister said disinvestment had often suffered from the “hangover of apprehension over management control passing into private hands”. “The public sector character of the listed companies will be maintained as at least 51% shareholding remains with the government”, he added. He said the government felt as long as it retained 51% stake and thereby remained the majority shareholder it should gradually capitalize its investment in those PSUs that have reached a stage where they did not require any handholding and utilize the proceeds for meeting social sector capital requirements. “Retaining more than 51% shareholding in a company has no impact on its character as a PSU and it only keeps government investment locked up, often at a value which may be lower than what the market would offer”, he added. The minister also said the government would stick to its disinvestment target of Rs 40,000 crore for fiscal 2011-12, but achieving this goal would hinge on many other factors like market conditions. Seven months of the ongoing fiscal are over, but the government has only been able to raise Rs1,145 crore through a stake sale in Power Finance Corp (PFC) and there are apprehensions it may miss the Rs 40,000 crore target for 2011-12. In view of the uncertain market conditions, companies like SAIL and Hindustan Copper Ltd have deferred planned fresh equity issues, though the government may still go ahead with its proposal to offload stake in them. It also plans to divest its stake in ONGC, BHEL, RINL and NBCC, among other companies. Last fiscal, the government raised Rs22,763 crore through the sale of equity in public sector enterprises. The Bangalore-based entrepreneur, who is also chairman of the UB Group, told a newspaper he was nearing a deal with 14 banks led by State Bank of India that would provide the loss-making carrier with working capital of Rs 600 crore ($118 million). He did not name the banks. Mallya, a flamboyant liquor baron who owns a Formula One motor-racing team, told the paper he was finalising a separate $250 million equity injection from an unnamed wealthy Indian individual to recapitalise the cash-strapped carrier. He added he was about to conclude a deal with the banks to reduce the interest rate which the airline is currently paying on its $1.4 billion debt pile. Shares in Kingfisher, which is named after its parent firm's best-selling beer, have lost around 68 per cent of their value so far this year. The airline, which listed when it bought out budget airline, Air Deccan in 2008, has never made a profit. Foreign exchange losses due to rupee depreciation have hit the profit figures of several companies in the second quarter results for financial year 2011 announced recently. A research report by Kotak Institutional says there have been large forex losses in several cases. It says the current account deficit and balance of payments problem and the consequent rupee depreciation is impacting the stretched and unhedged balance sheets of Indian companies. Sectors such as technology and energy will gain from a weaker rupee while firms with high foreign currency borrowings will be impacted. The report says the results of the BSE-30 companies were marginally below expectations. Rupee depreciation disrupted earnings through forex losses (unhedged ECB exposure) in several companies. Other highlights of the quarter results were a sharp jump in the NPLs of banks and net debt of infra companies, low sales growth in the pharma sector and weak order booking for industrial and construction firms. Sectors like cement, consumer and utilities sectors beat expectations while construction, industrials, metals & mining fell short. The Q2 results also confirmed continued ongoing weakness in the domestic investment cycle. More importantly, management commentary was generally weak in investment-related companies, the report says. There was also a steep increase in bank NPLs over the last quarter. The sharp increase in gross NPLs quarter on quarter is a concern and highlights full conversion of PSU banks’ NPL recognition process to system-based recognition of NPLs. It also points to a weaker financial position of borrowers given continued high interest rates and operating challenges, particularly in the agriculture, infrastructure and SME segments. A report by Motilal Oswal points out that while the index companies performed well, companies in the broader market indices did not. It says that slowing revenues, margin pressures and higher interest cost impacted profit after tax growth. PAT growth was led by cement, oil & gas, utilities followed by private banks. Sectors that had an adverse impact on aggregates were telecom (down 36%), metals (down 6%) and other sectors which grew in low single digits (capital goods, PSU banks and autos). Among the institutions that could be downgraded are Bank of America Corp, Citigroup Inc and Morgan Stanley, said Baylor Lancaster, an analyst at CreditSights Inc. Some European banks could also be affected. On November 9, S&P downgraded its scores for the health of the banking industries in a number of countries, including Denmark, Sweden, Finland and the Netherlands. "If there’s a business case, we’ll consider assembling more models, even including the Jaguar cars, in India," JLR India head of the firm’s premier car division Rohit Suri told reporters here. Asked if the company has identified any models for assembly in India, he said: "No final decision has been taken and the evaluation process is ongoing." 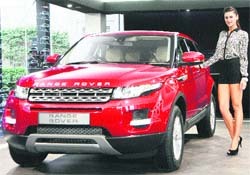 At present the Freelander 2 is assembled at Tata Motors' Pimpri plant near Poona. He also said the assembly location of other models could either be at the same plant or elsewhere depending on the "business case". When the Punjab cabinet meets Saturday, it is expected to grant approval for setting up of nine mega rice shelling units with an estimated investment of Rs 502 crore. Eight mega rice mills are being set up Soma Punjab Agro Power Infra, with each mill having the processing capacity of 20 tonne per hour and a biomass plant of 3 mega watt capacity. The company proposes to invest Rs 472 crore for setting up these eight mega rice units. The other project expected to be approved is a mega rice mill by Bajaj Basmati at Ferozepur, requiring an investment of Rs 30.56 crore. Both the projects have already been cleared by Punjab Agro Corp. While two mega rice units are already operational — one in Fatehgarh and the other in Sangrur, the state government had approved four other mega rice mill units last year. Since all nine rice mills are being set up with an investment of over Rs 25 crore, they will get all the concessions given to mega units under the government’s mega agro projects policy. Talking to The Tribune, Rajiv Setia, president of the Punjab Rice Millers & Exporters Association, said with mega rice units drawing many fiscal concessions, the business environment would become economically unviable for small and medium rice mills. “The small and medium units already have much lesser working capital at their disposal, than these mega units. With so many concessions, these mega units will drive the market by lowering their prices. In such a scenario the small and medium rice mills won’t be able to survive,” he added. Arvinder Pal, MD of Amar Singh Chawal Wala, too, expressed concern over the sops given to the mega units. “The mega rice projects get fiscal concessions of up to 7%, besides exemptions from CLU, electricity duty and EDC. This makes the cost of rice cheaper for them and they can still sell it at the same or lower price than the smaller units, who have to pay an additional 7% as taxes,” he added. The joint venture, India Gas Solutions, will also develop infrastructure to accelerate transportation and marketing of natural gas within the country, the companies said in a press statement. BP acquired a 30% stake in the country's biggest gas fields, KG-D6, in a $7.2-billion deal to buy stakes in 21 blocks of Reliance. The deal was completed on August 30. A few days ago, Reliance Industries and BP proposed that the infrastructure at the deep-sea D6 gas fields can be shared with neighbouring blocks of ONGC and GSPC to save development costs and raise government's revenue from new output from the gasrich block. The oil ministry officials and experts in the directorate general of hydrocarbons support the suggestion in principle, three people with direct knowledge of the matter said. The companies made the proposal at a recent meeting with ministry officials. Officials in the directorate general of hydrocarbons said Reliance's infrastructure can be used by state-run firms ONGC, which will start production from an adjoining block by 2015, and Gujarat State Petroleum Corp, which is expected to pump gas from the same basin within two years. "While valuations are not the only driver of stock returns, we believe these stocks have priced in a lot of good news," said Credit Suisse in a note on Thursday. The house believes India is the only country where monthly momentum in consumer price index continues to be high, which could be a catalyst for the three Indian stocks to underperform. However, actual inflation on the basis of the CPI figures can only be calculated from January, 2012, once the data — which was compiled for the first time at the start of this year — has stabilized.